Eternal Orthodox Church calendar for the 10.07 year 2017. This saint was born of rich and eminent parents in ancient Rome, where he studied all the secular wisdom of that time, devoting himself in particular to the study of medicine. Sampson was a compassionate and liberal physician, and gave the sick medicine for both soul and body, counselling each man to fulfill the requirements of the Christian faith. He moved to Constantinople, where he lived in a tiny house from which he distributed alms, comfort, advice, hope, medicine and all possible aid to those suffering in spirit and in body. The Patriarch heard of Sampson"s great virtue and ordained him priest. At that time the Emperor Justinian the Great became ill with what his doctors believed to be an incurable disease. The Emperor prayed with great fervour, and God revealed to him in his sleep that Sampson would heal him. When the Emperor summoned Sampson to court, the old man had only to put his hand on the diseased place and the Emperor was healed. When Justinian offered him an immense sum of money, Sampson thanked him but would accept nothing, saying to the Emperor: "O Emperor. I had silver and gold and other riches, but I left it all for the sake of Christ, that I might gain heavenly and eternal wealth." When the Emperor insisted on doing something for him, Sampson asked him to build a home for the poor. In that home, Sampson cared for the poor as a father cares for his children. His compassion for the poor and weak was second nature to him. This holy man, filled with heavenly power and goodness, entered peacefully into rest on June 27th. 530. He was buried in the Church of the Holy Martyr Mocius, his kinsman. After his death, Sampson appeared many times to those who called upon him for aid. 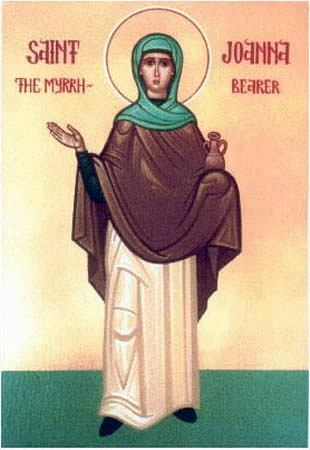 She was the wife of Chuza, Herod"s steward (Lk. 8:3). When Herod had John the Baptist beheaded, he cast his head out into an unclean place. Joanna took the head and buried it with honour on the Mount of Olives, on Herod"s land. Later, in the reign of Constantine the Great, the head was found. St Joanna is also remembered because she was present at both the Passion and Resurrection of Christ. She died peacefully. 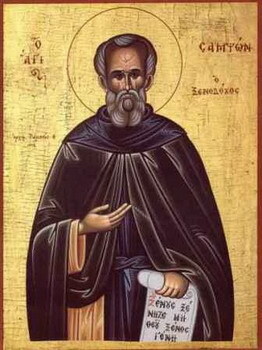 The Holy Martyr Anektos of Caesarea was beheaded by the sword for his confession of faith in Christ during the persecution by Diocletian (284-305). 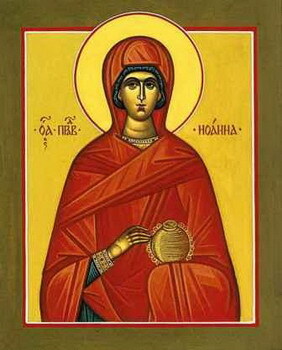 Saint Joanna the Myhrbearer, wife of Chuza, – the household steward of king Herod, was one of the women following and attending the Lord Jesus Christ during the time of His preaching and public ministry. And together with the other Myhrbearing Women, after the death on the Cross of the Saviour, Saint Joanna went to the Sepulchre to anoint with myrh the Holy Body of the Lord, and she heard from the Angels the joyful proclamation of His All-Glorious Resurrection. 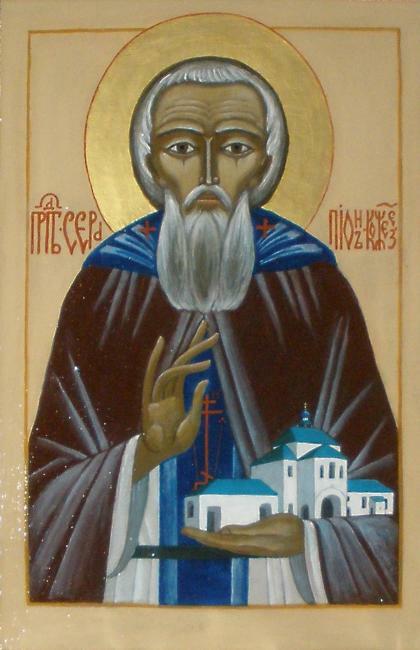 Blessed Martin of Turov served as a cook under the Turov bishops Simeon, Ignatii, Joakim (1144-1146) and George. 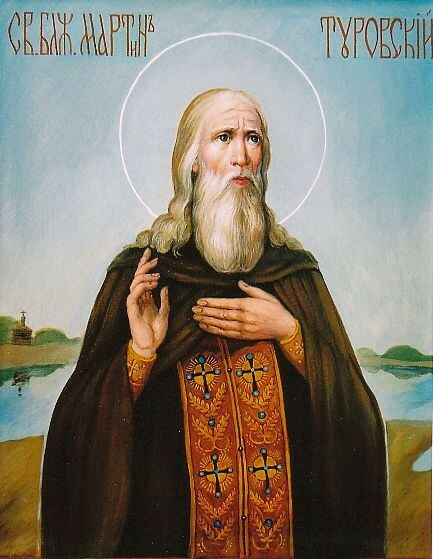 This last hierarch retired Saint Martin because of his age. 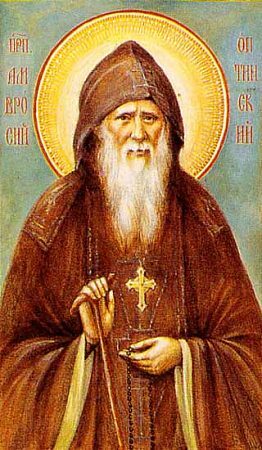 But the old man did not want to part from the monastery (the bishops made residence at the monastery of Saints Boris and Gleb), and so he accepted monasticism. In his former work he had often overexerted himself and therefore often fell ill. One time Saint Martin lay motionless and in moaning with sickness. He fervently called on holy Saints Boris and Gleb for help, and on the third day the saints appeared to him, gave him a sip of water, and healed him from his illness. After this miraculous healing, Blessed Martin survived for yet another year.